How the NMC was dummied into appointing Eva Lokko Accra, Oct. 29, Chronicle -- MS EVA LOKKO, the divisive Director-General (DG) of Ghana Broadcasting Corporation (GBC) sounded tetchy as she stretched herself properly in the office sofa almost in tears when her dodgy records at GBC that got her dismissed in the late 1980s popped up. The occasion was an official interview between The Chronicle and the GBC boss on Monday, at her office, over series of allegations that were of national interest. Ms Eva Lokko had told The Chronicle about her academic success and indisputable records at GBC as the broadcast engineer, dating back to the 1970s and how she helped to install the current broadcasting equipment at the corporation. She told The Chronicle that she was blameless and more than qualified for the top management post at GBC and for good measure, added how she impressed the eleven-member panel from the National Media Commission during the interview for the job. But a few minutes later, Ms Lokko was reduced almost to tears when she was asked to tell why she was dismissed from the GBC in the late 1980s and whether she ever volunteered the information to the NMC when she was applying for the top post. Quite clearly, knowledge of the fact that she was dismissed from GBC would have been decisive in disqualifying her. Either the information was known and suppressed or she may have lied about it to the panel. That she did not know that she had been dismissed was to willingly suspend disbelief. Either way, it represents troubling issues of integrity in public office with possible legal implications. It has been suggested elsewhere in the press that her political godmother is Ms. Oboshie Sai Cofie of Media Touch, an advertising production company in Accra and who works in the Office of The President. 'So I have been dismissed from the GBC and I am not aware, and could you please direct me to your source or can I see the dismissal letter?” she pleaded. 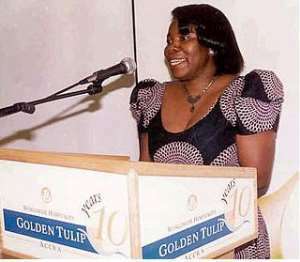 Chronicle Investigations reveal, however, that in 1989, Eva Lokko was dismissed from the GBC when she allegedly submitted a questionable medical report to seek extension of sick leave when she was on the verge of losing her position as broadcast Engineer. The reason was that she had vacated her post without due process or permission. Chronicle gathered that when her attention was drawn to this problem, she submitted what was suggested to be 'questionable' documents to convince the authorities of the corporation that she was indisposed and should be given longer time to recuperate. According to insiders, the management, after going through Lokko's affairs, realized that she was trying to throw dust into the eyes of the management. Insiders hinted that she was given the choice to submit herself for medical examination by the appropriate medical practitioner but failed to avail herself. It emerged that she was busily sorting out her private agenda outside the country. Documents on The Chronicle's investigations desk indicated that Eva Lokko's dismissal affair was used as a yardstick of supreme authority to measure similar cases at GBC since other employees adopted what was then described as 'dubious tactics' to write to management to offer them sick leave. In later times, GBC stars like Nana Ohene Ntow, the articulate official spokesman for the Ministry of Finance and the similarly smart David Ampofo of Channel 2 Communications were eased out of GBC because they had gone on study leave and were adjudged to have overstayed while completing their studies. In both cases, GBC was not funding the studies. Chronicle wrote at the time in the 1990s - 'GBC LOSES ITS BRAINS' when these two brilliant presenters/broadcast journalists were not reabsorbed. Ntow was studying for his Masters degree in Canada. For instance, on August 9,1990, Lokko's dismissal was used to deal with the late Mr.Richard Kotey, one of the finest newscasters' affairs when he also submitted a medical report exactly as Lokko's, to seek extension of leave on medical grounds. Mr. Kotey took up an appointment with the Voice of America in Washington DC, USA. In a memo to alert the then Director of Administration (DOA), the then Principal Administrative Officer, Mr. Ago Ablo, stated that it was becoming the practice of members of staff who traveled abroad on their own to seek extension of leave and where that failed them, they submitted medical reports giving them long period of excuse duty. Similarly, he said ultimatum was given to one Mr. Corquaye, an officer with the corporation when he went to Britain and attempted to use 'Lokko-like tactics' for extension leave but quickly reported back. Then came the bombshell. He disclosed that, “ Ms Eva Lokko a broadcast engineer used the same tactics being used by Kotey and she was dismissed.” When Mr.Ablo was eventually reached by The Chronicle about the use of Lokko's dismissal as the point of reference in the Richard Kotey affair, he confirmed being signatory to the letter. Despite a search by The Chronicle intelligence team into the records centre of GBC, the old files of Ms. Lokko could not be traced, but interestingly, Ms Lokko was using her old staff number still.